December 2000 No images selected for December 2000. 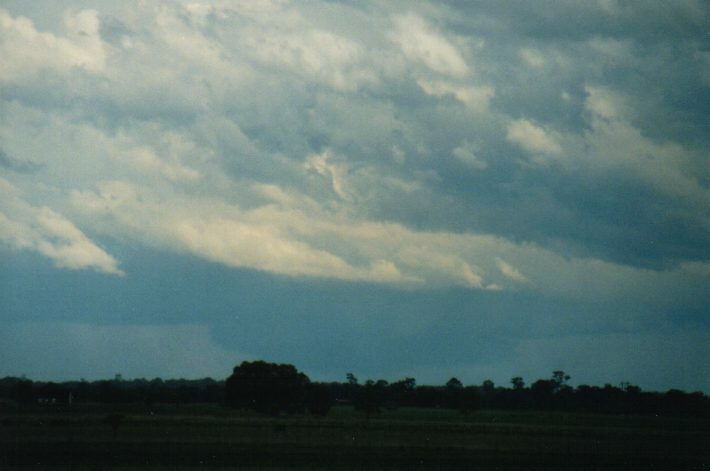 The 25th October 2000 really fired up in spectacular ways in NE NSW and SE QLD. 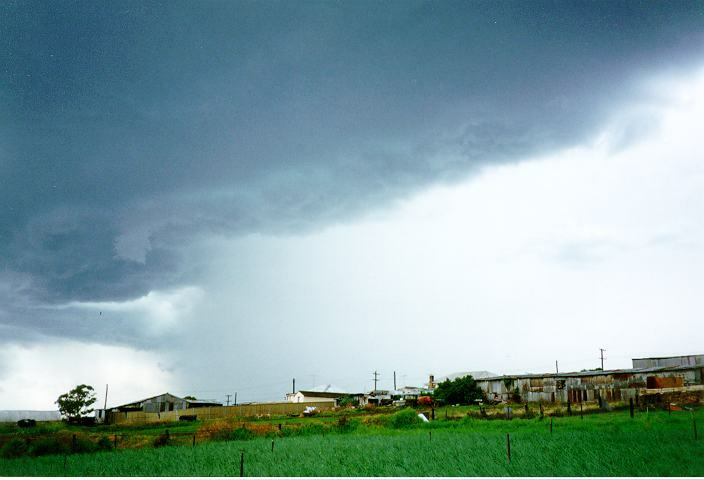 Thunderstorms were widespread and in places severe. 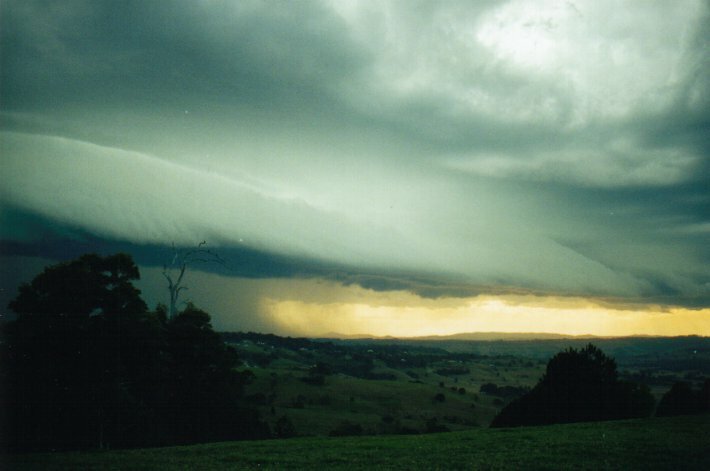 A large line of severe storm activity spread through the Richmond Valley of NSW, from Casino to the coast producing this magnificent shelf cloud formation photographed just south of Alstonville. 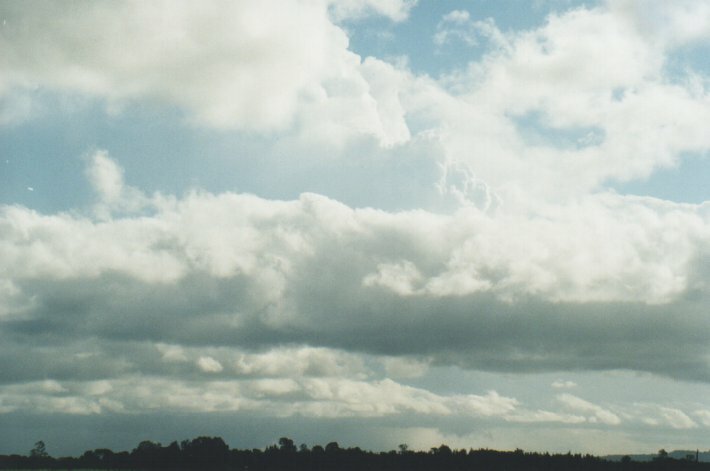 On the northern flank (right in the second photo) many intersting base lowerings occurred which are not always associated with shelf clouds, and may in fact have been a wall cloud. Refer to the full report for details. Later on a second shelf cloud moved through the region and gave on nice lightning show as it approached. The 31st of December 1999 was a day waiting for fireworks. But Michael Bath got more than just that! 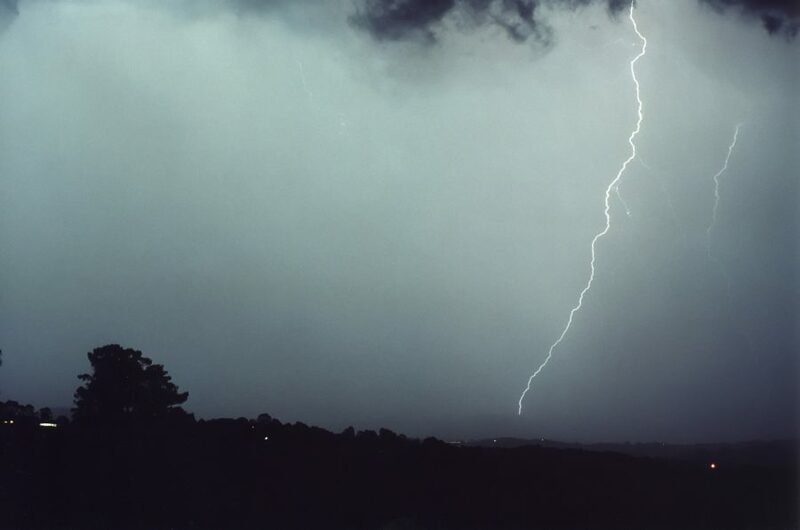 As what happened several times that season, severe storms approached from the southwest during the afternoon and then around and closer to midnight. There were the usual damage reports and warnings were issued for the event. 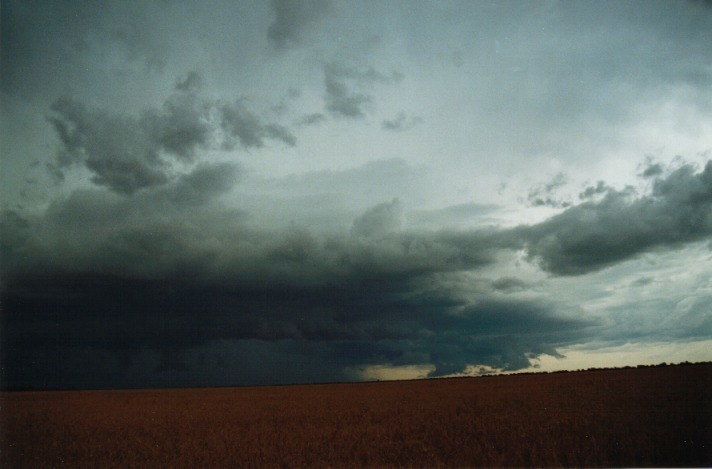 The storms during the afternoon exhibited suspicious lowerings under the main updraught region. The 4th of January 2000 was a day waiting to explode. 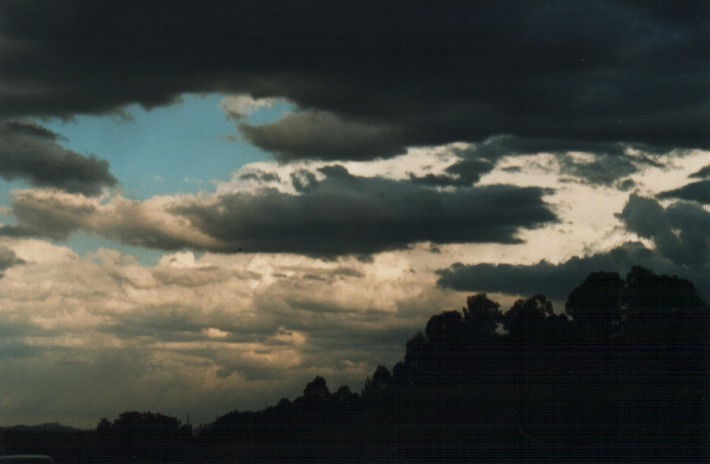 Conditions were ideal with good wind shear, low level moisture and warm temperatures. 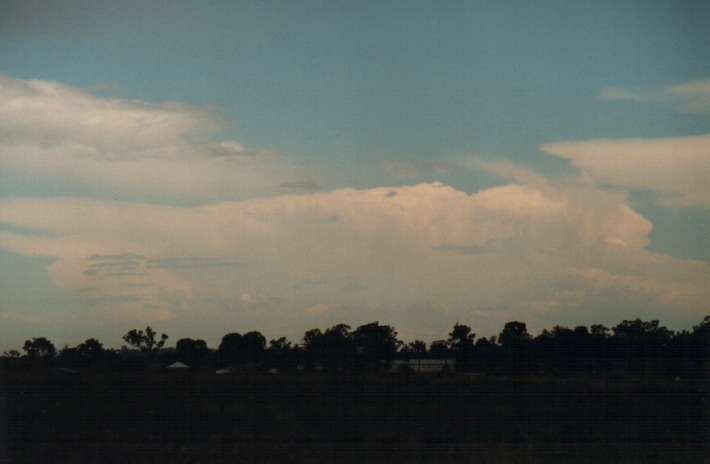 Storms were already developing during the morning near and south of Bathurst. 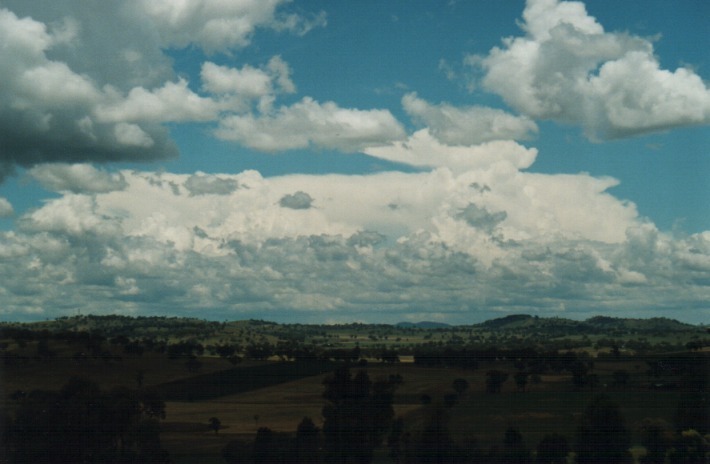 By mid-morning large, bulging cumulus developed rapidly near Bathurst. 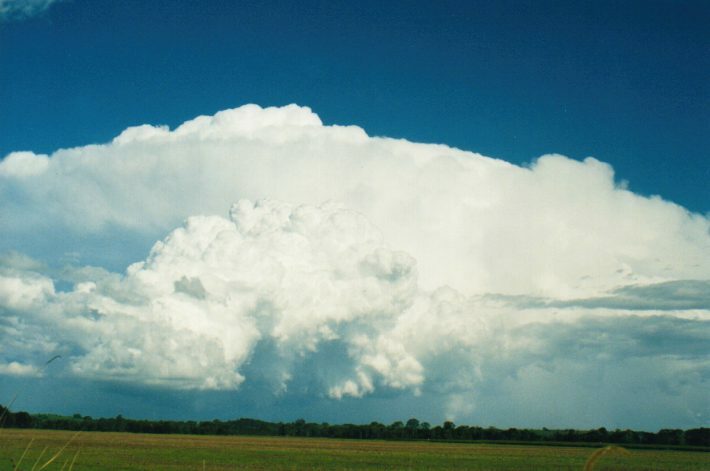 Storms developed from these large cumulus and broke straight through the cap. They were forming along a line followed by the drier air. 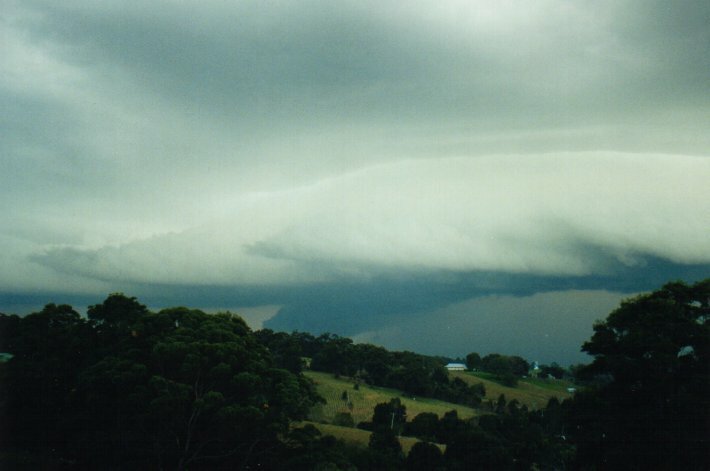 Gradually they formed into a squall line structure which dissipated as it moved towards Sydney. During the afternoon, more storms developed behind the squall line band. One persisted and moved towards the south coast near Nowra to eventually move off the coast. All in all an awesome day of activity with drier air moving through driving activity off the coast and into the Hunter. 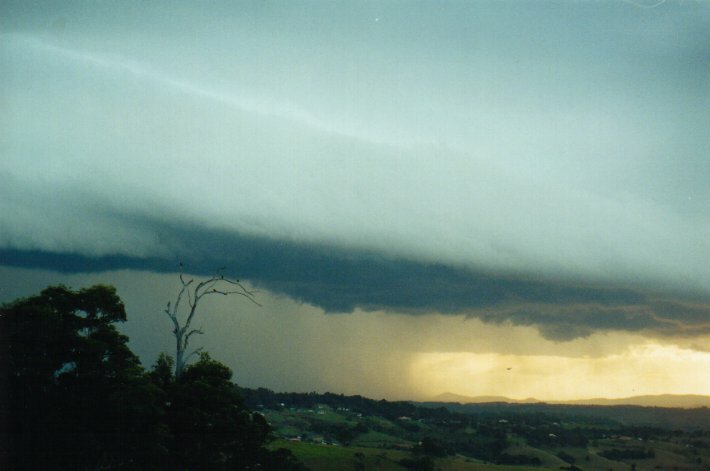 On the 9th July, 2000 models were indicating high CAPE (Convective Available Potential Energy) with a trough acting as the trigger in northeast New South Wales. Storms developed along this trough and aligned themselves in a squall line. The squall line developed with some very spectacular gust front features. This event was certainly unusual as it exhibited a more summer like feature but occurred in the middle of winter. 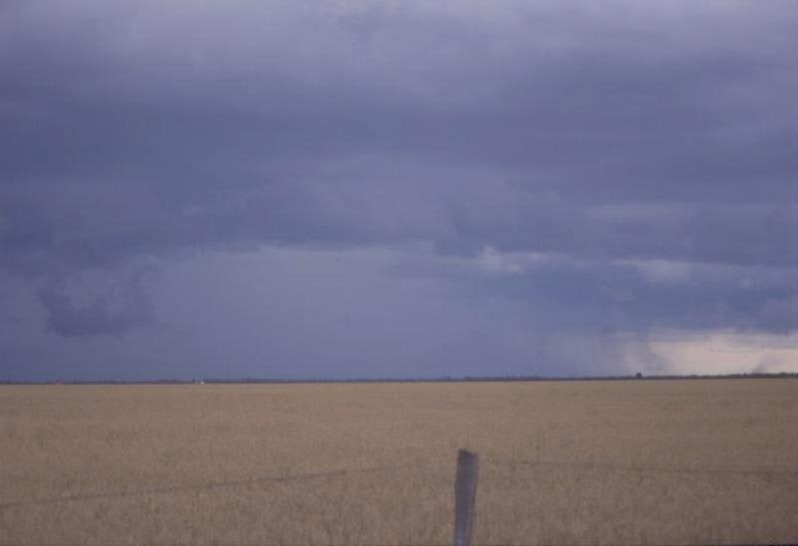 Hail and very heavy rain was observed with this event at McLeans Ridges near Lismore in north-eastern NSW. 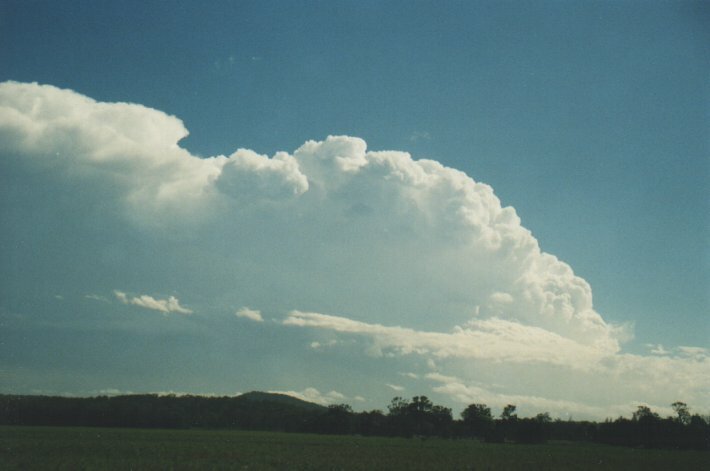 On the 27th November 1999, models were indicating high CAPE (Convective Available Potential Energy) conditions. 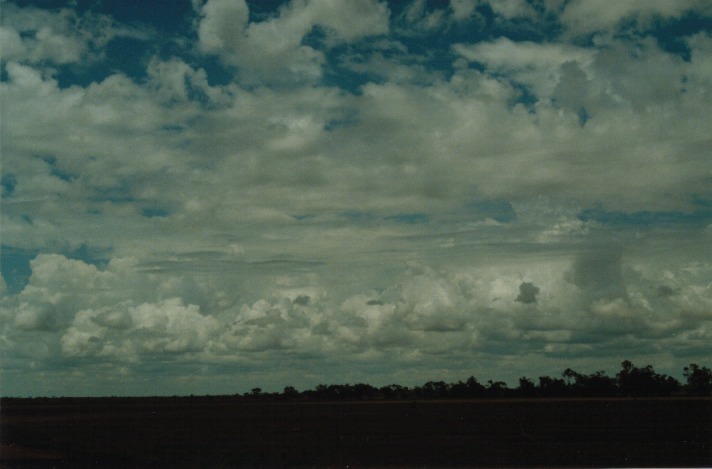 Cumulus developed rapidly particularly to the south of Cunumulla in western Queensland. A change in dew points was observed with dew points decreasing on the northern and southern and winds converging along this convergence line. Winds on the northern side were light northerly and southeasterly on the southern side. A squall line developed with some very spectacular gust front features. It was interesting that the alignment of this squall line was almost east to west. This meant that the formation of cells was on the eastern side and moved gradually left along the line. 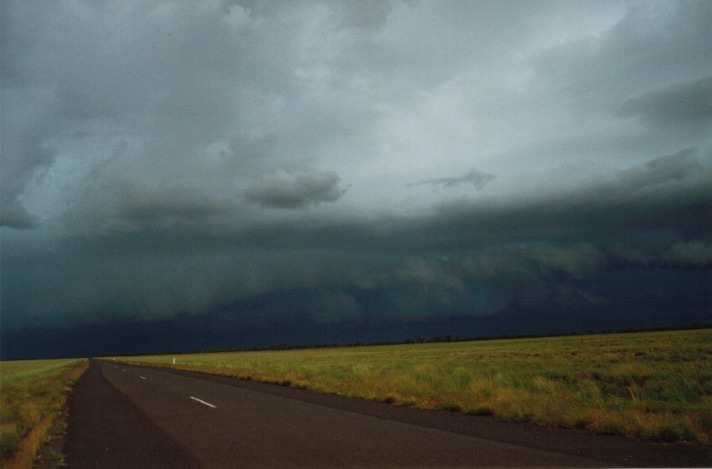 Together with such flat land features, this certainly formed one of the most picturesque storm formation on the "Thunder Down Under Storm Chase 1999". 30th December 1999. With a cold pool of dry air approaching from the north west, sufficient moist air in the lower layers, and an approaching upper level jet, it was an ideal setup for severe storms. The first storms developed during the afternoon and these persisted until later that afternoon. Hail was reported from the region near Wisemans Ferry from these storms. 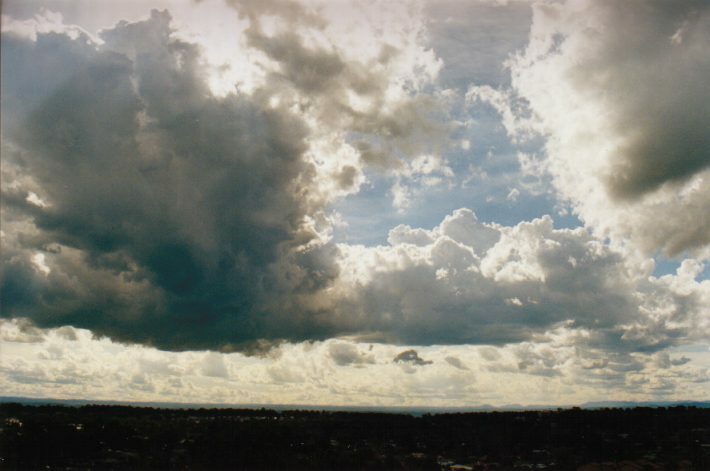 Throughout the afternoon, more cumulus developed into thunderstorms and then became more widespread. The tops of these cells were extremely crisp - evidence of the cold air aloft. Later, secondary cells developed near the earlier Wisemans Ferry cell (that had moved off the coast). 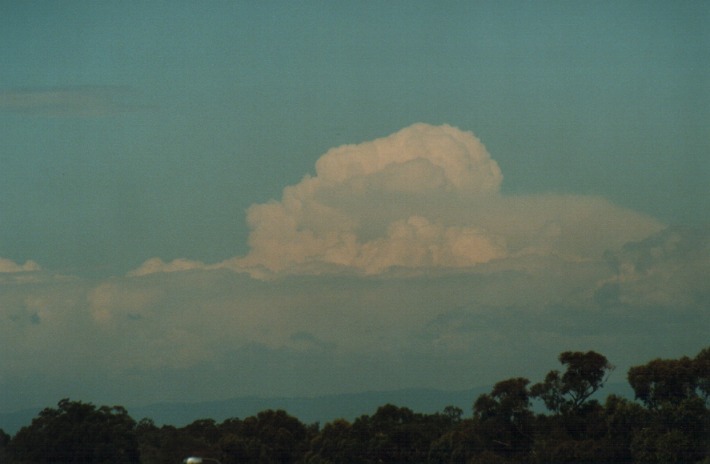 This cell exploded as it hit the jet over the lower Hunter region. 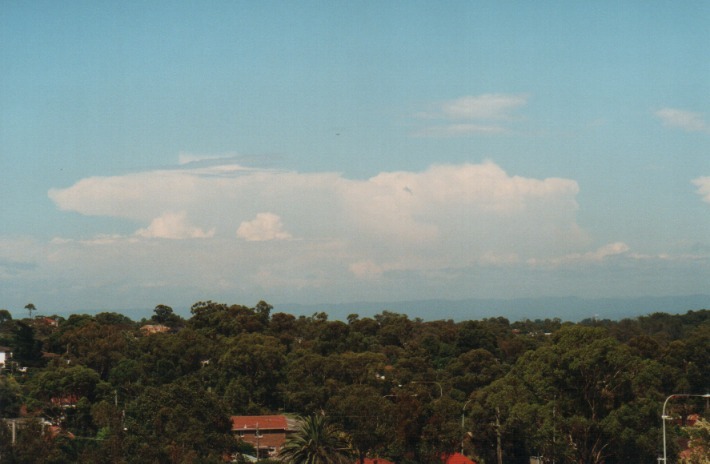 An unconfirmed supercell was sighted moving through Maitland with large hail. 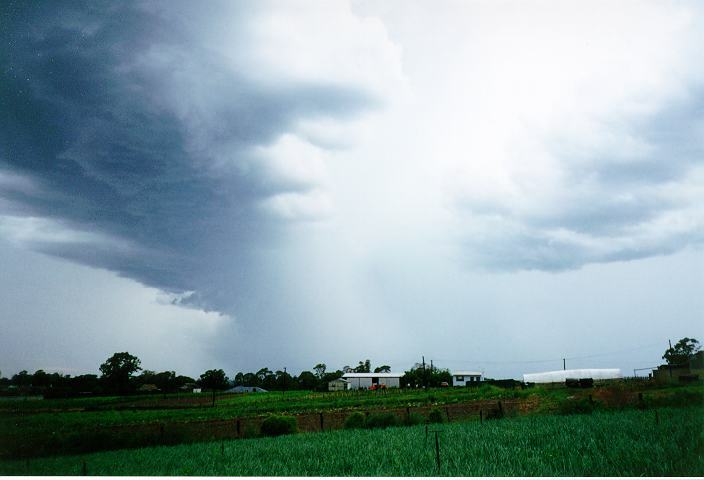 The hail from surrounding storms was widespread. 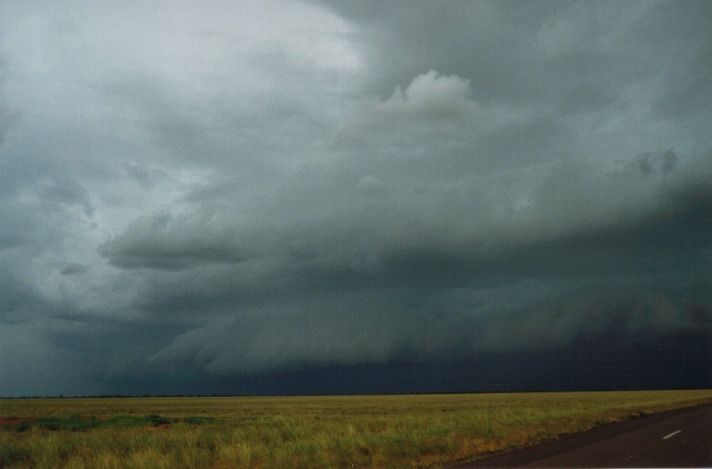 The storms eventually moved through Paterson and towards the coast north of Newcastle. 13th November 1998. The symoptic situation for this day indicated a low and associated trough line gradually clearing the band to the southeast. 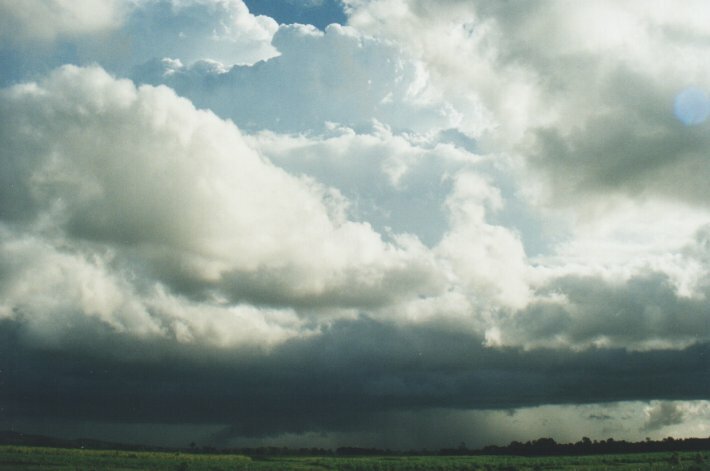 The wind shear was favourable and the dry air following the moist air was perfect for a severe weather outbreak. 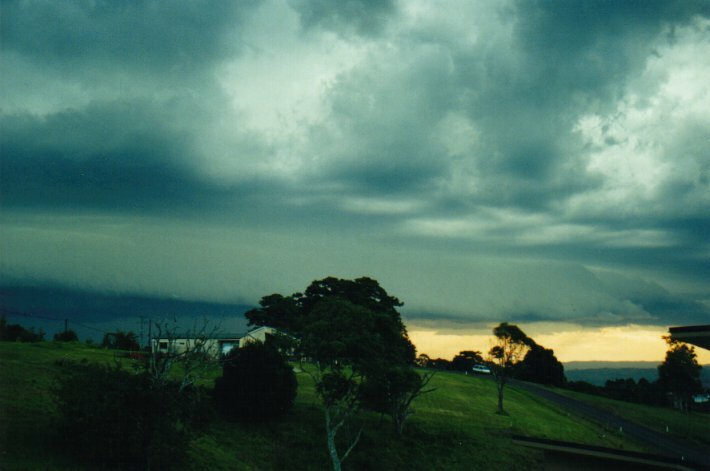 The potential for storms on this day was verified by early afternoon as severe thunderstorms developed and headed straight for the Wollongong region. 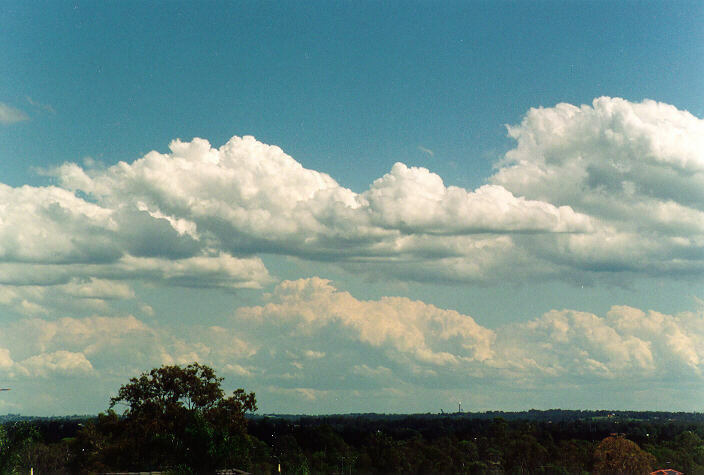 There were several potential cumulus in the Sydney area but they could not break the "cap". 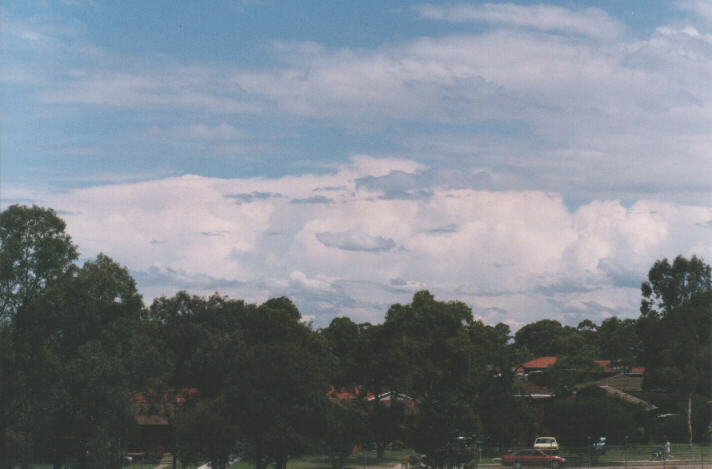 During the afternoon, the cap did break and three thunderstorms developed heading south east towards the southern suburbs. At least the last two of these cells were severe with large hail and very heavy rainfall. 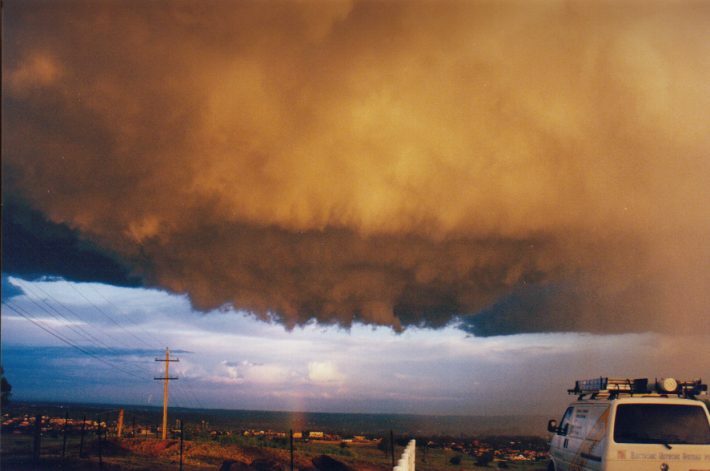 It was one of the most spectacular set of storms in recent years watched by several storm watchers. 20th January 1996. 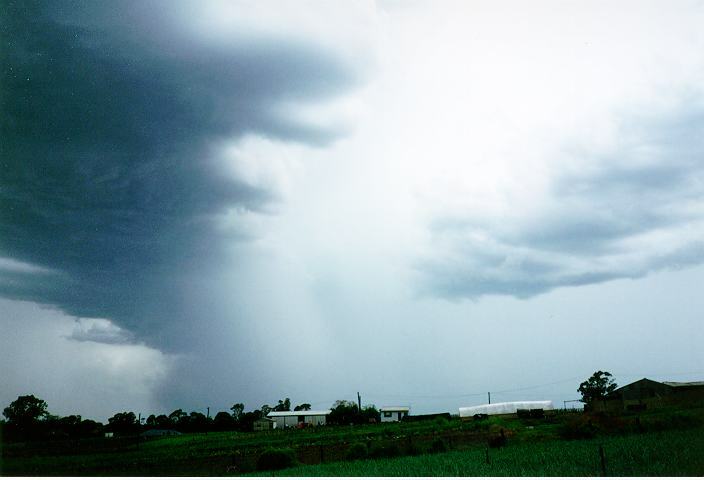 This storm system occurred over a couple of days. 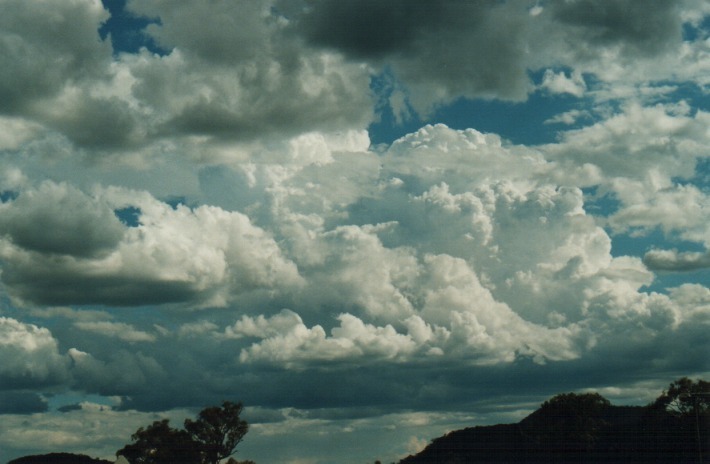 The previous day had produced a spectacular thunderstorm. Well this storm event was not as spectacular but far more severe. Cells developed during the afternoon. 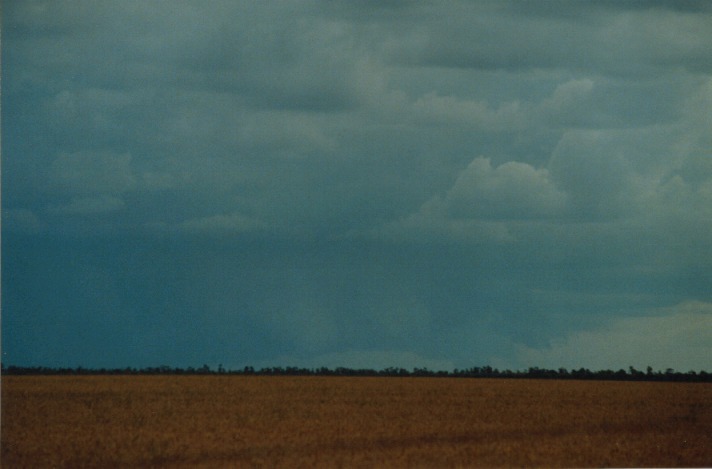 One cell in particular was located to the north of Schofields. I watched as this cell develop along its southwestern flank which meant it approached Schofields. I saw the white in the trees half a kilometre away approach and suddenly we were hit by a microburst. Hail to about 1cm and very heavy rain pounded the window driven horizontally by winds up to 120km/hr in strength. It lasted about 6 minutes and then moved further southeast. 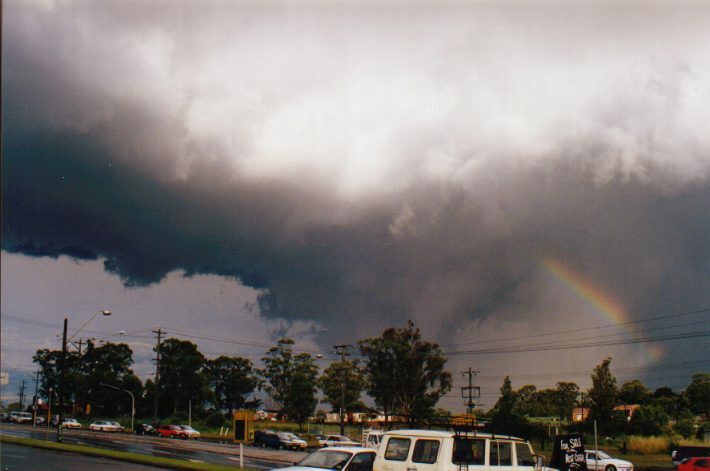 It was these storms that tracked towards the lower north shore and dropped a funnel which wiped out several trees in the area. 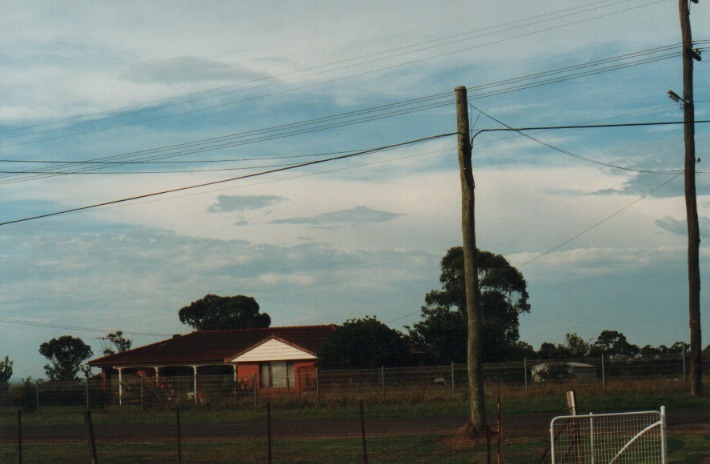 There were many suburbs affected by damage mainly along the path of this storm. The 5th November 1995 was an unusual day! 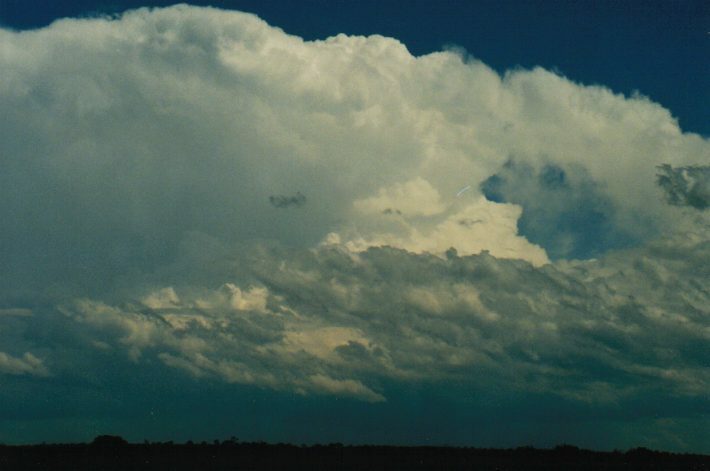 There were signs that thunderstorms would occur but when Michael Bath and I went for an observation session, we observed mostly widespread cumulus congestus. 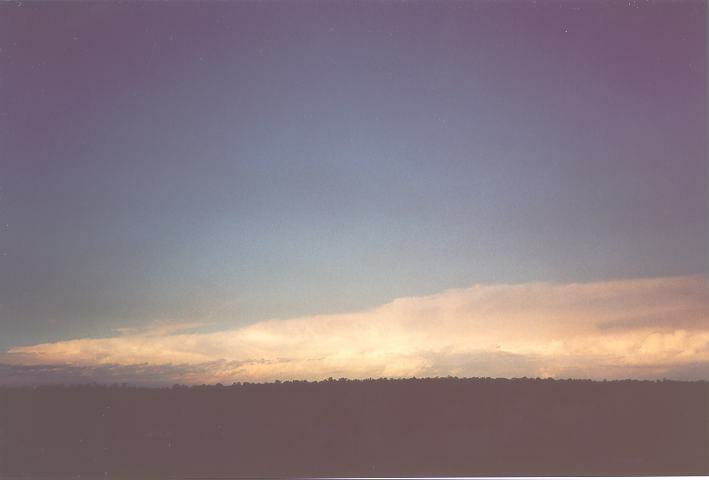 I could just make out storms but we weren't sure. After returning to my place, a nice convection shower developed from the northwest. 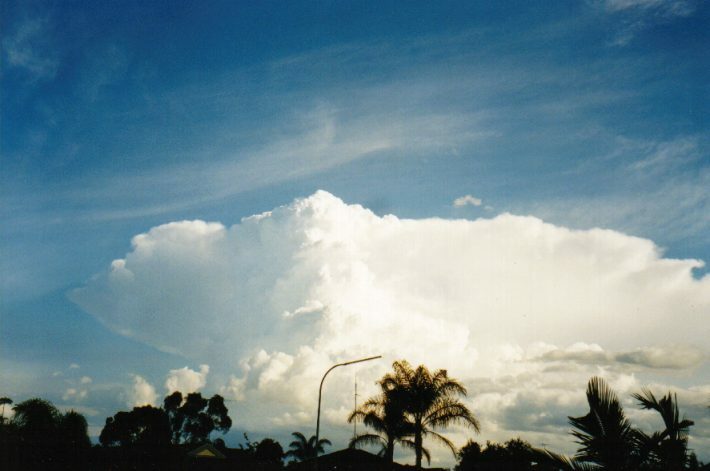 More congestus developed to the north and eventually became part of major hailstorms on the Central Coast. 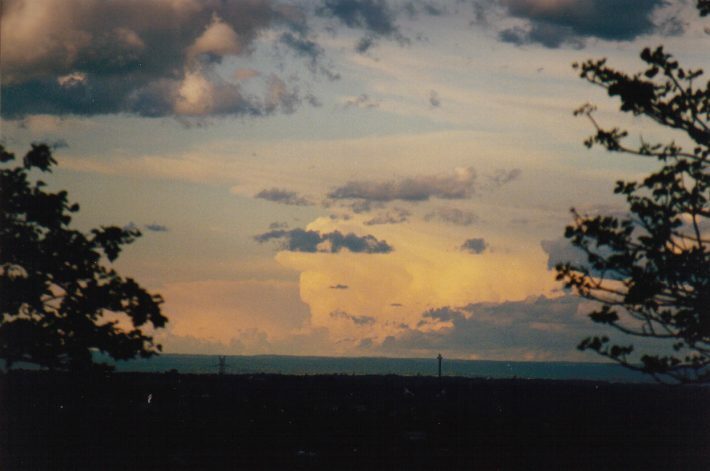 During the evening, cloud began to increase and indicated chaotic behaviour. 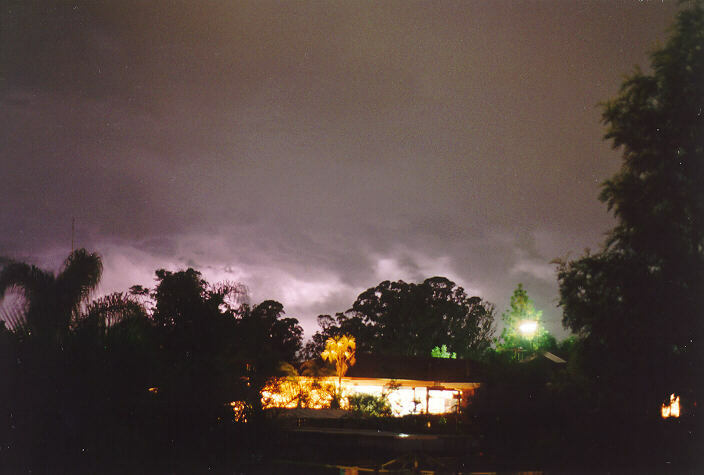 A band of eletrical storms passed over during the night. 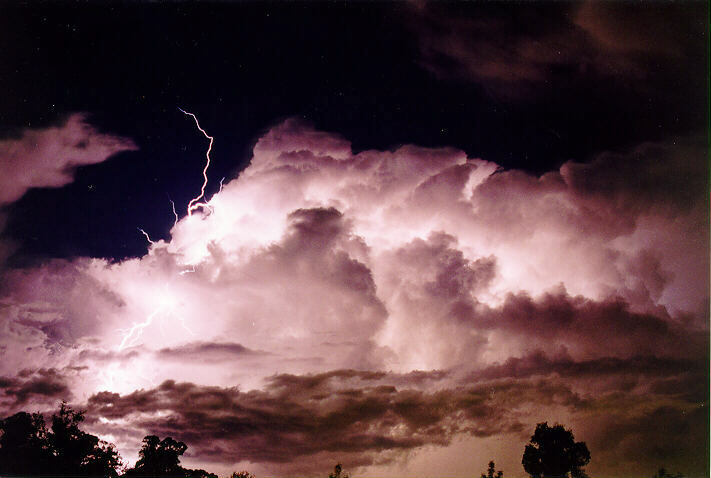 Some spectacular lightning were observed with some lightning coming out of the side of the cloud! This was the first time I had ever observed this but maybe because this particular storm was isolated and nearby. 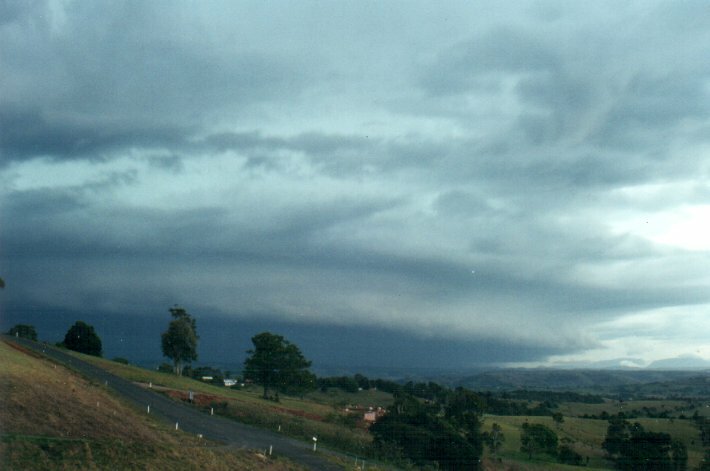 It may have been somewhat of a surprise, but 24th October 1999 was a supercell outbreak on the north coast of New South Wales and SE Queensland. 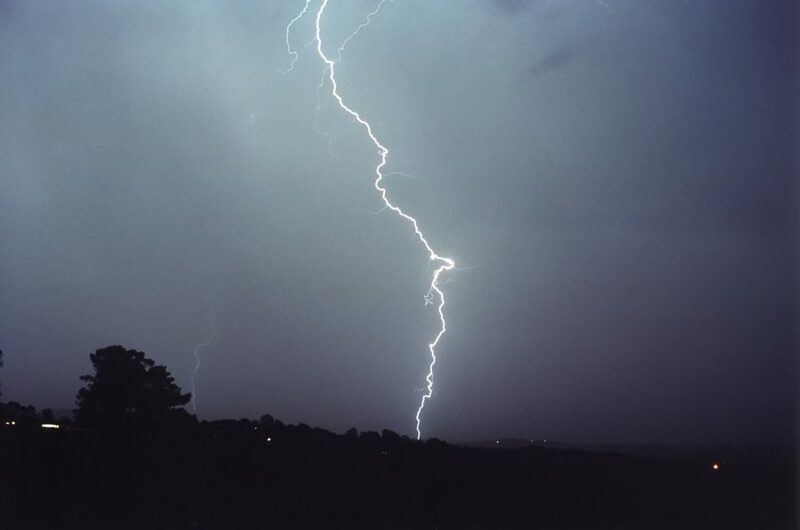 The low pressure system had dumped its rain overnight and had curled down through Wollongong causing flashfloooding. 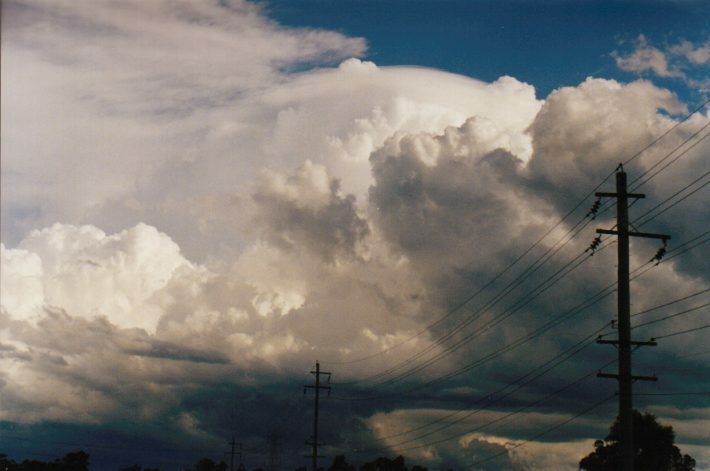 Storms developed rapidly along the north coast under the influence of the jet maximum and favourable windshear. The supercells that resulted had interesting lowerings as well developed v-notch anvils. 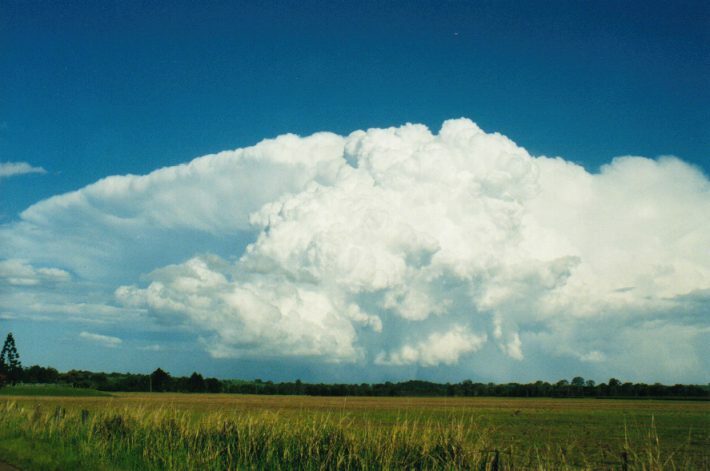 Large to giant hailstones were reported from some of the storms. The storms then moved rapidly offshore. 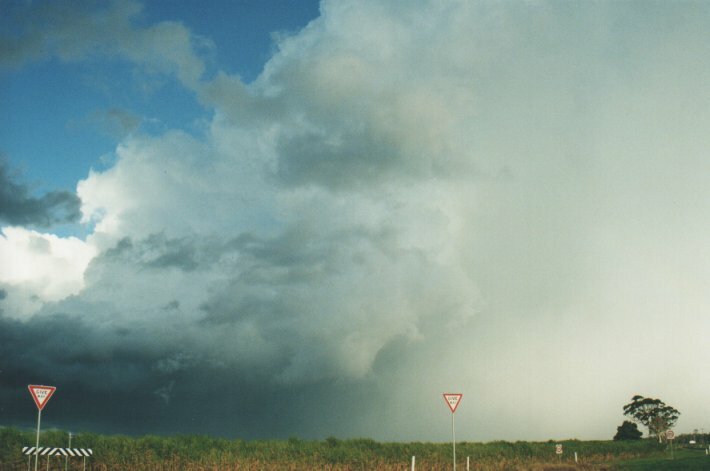 22nd November 1999 was a classic situation where supercells were likely to develop in southeast Queensland. 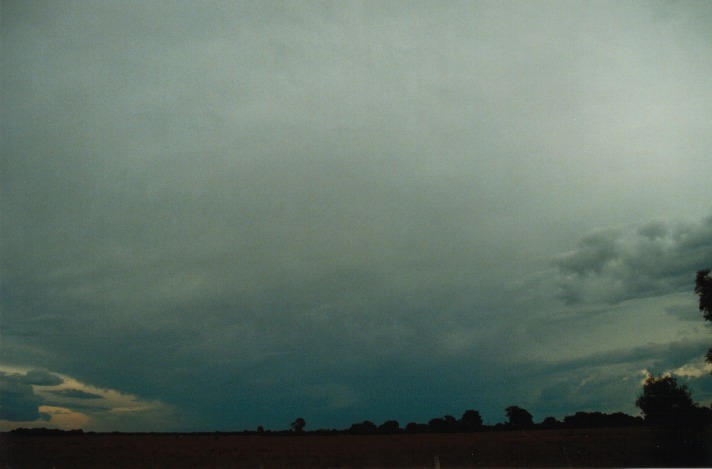 The storms developed with strong updraughts and this particular supercell near Surat seemed to have a v-notch anvil. 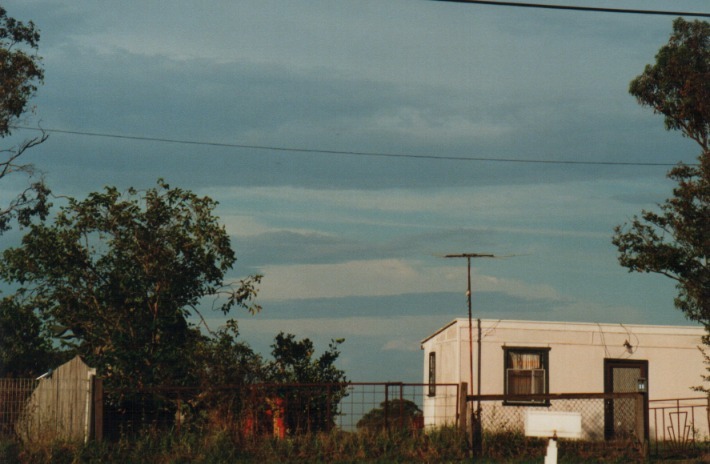 There was a wall cloud observed and later a pendant was also observed and videoed. 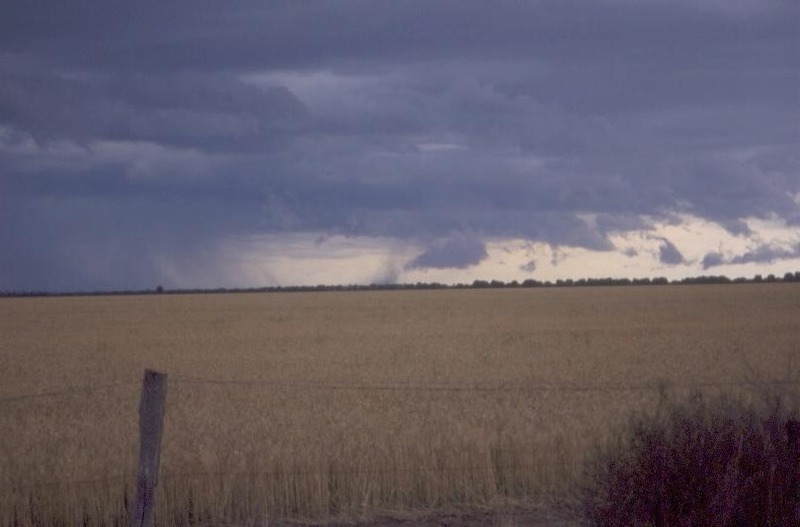 The main feature of this storm was the dust whirl that rose hundreds of metres into the air. 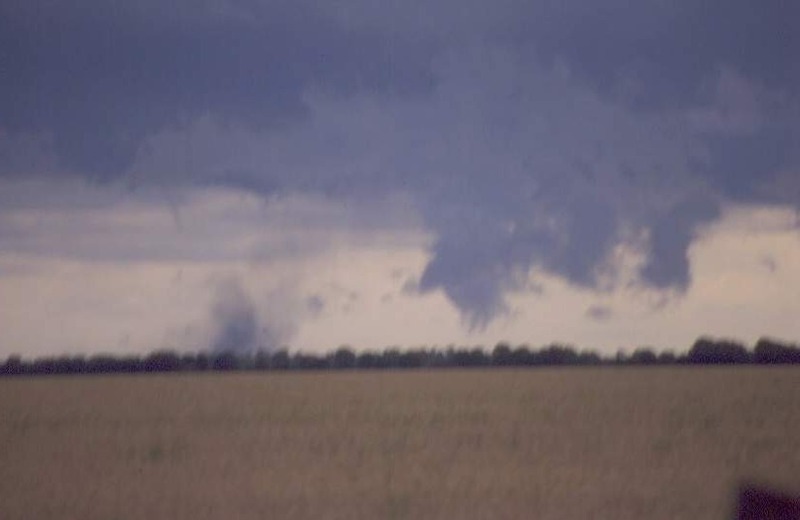 A funnel was observed briefly but seemed to rope out but the dust whirl lasted a few minutes. 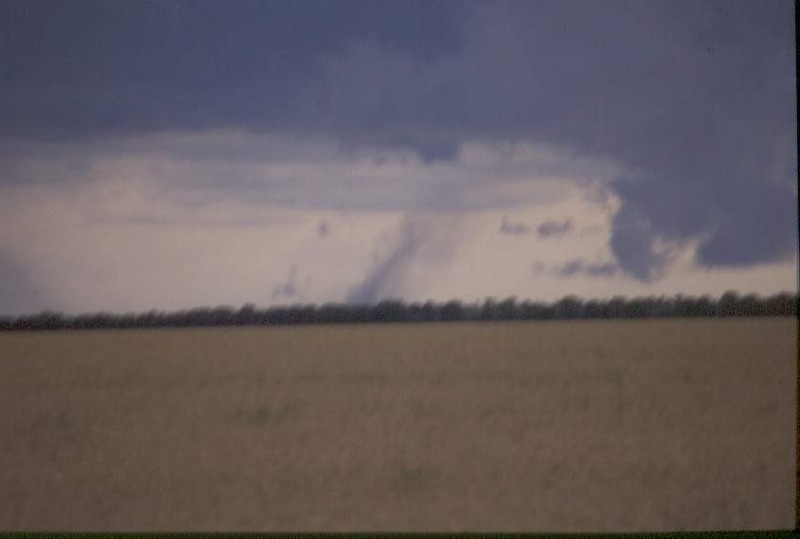 It is believed that this was a tornado, most probably a weak F0 tornado. 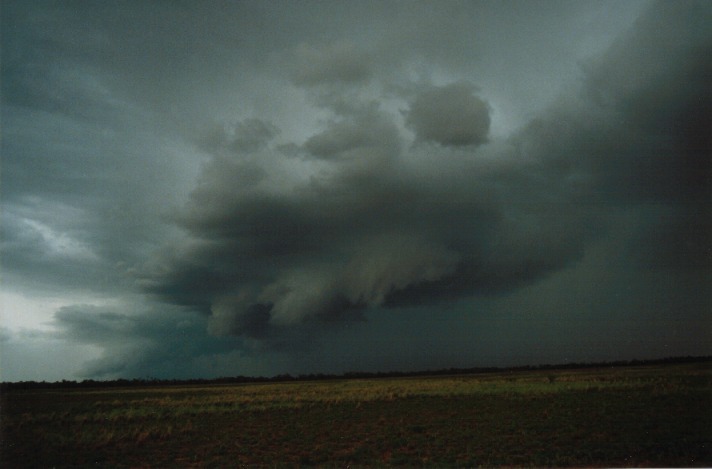 This came from the area of the rain free base as a strong surge of outflow developed from the precipitation core. Note the funnel in the third slide.